One of Canada’s 10 Google Glass Explorers is trying to get Toronto ready for the wearable technology that he says has big potential to change people’s every day lives, launching three apps that add an augmented reality layer on top of the city. 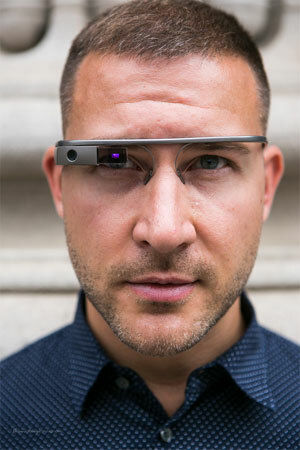 Tom Emrich, a consultant and tech writer that has been using Glass for about two months, calls Toronto home and says he wants to make the city as Glass-compatible as possible. It’s not easy to get a Glass unit from Google right now – and not cheap – but Emrich foresees a time when Glass will be a mass market product. “When I got my device I had this crazy dream to try to make Toronto the most Glass-ready city in the world,” Emrich writes in an e-mail. In building out two apps with digital agency SplitElement Inc. and collaborating with BNotions developer Macy Kuang (whom we also worked with to show us Glass on the streets of Toronto in our recent video), Emrich is showcasing how Glass may be useful to consumers and how it could improve the impact of digital local marketing efforts. A restaurant finder that taps into Yelp’s local directory. Developed by Emrich and Aaron Surty at a Hackathon organized by Kuang in July, the app can actually be used at any city in North America. Glass wearers simply use voice commands to filter out what type of restaurant they’re looking for (Eg. Thai, Greek, Cronut Burger) and see the five closest restaurants to their location. From there, the user can get directions to the restaurant or call it for takeout. 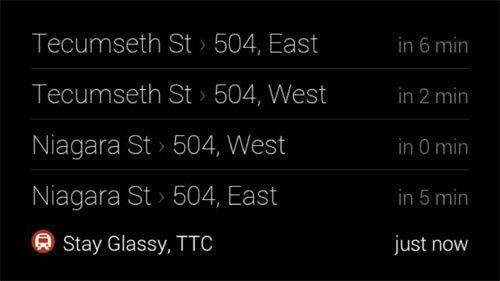 A public transit guide for Toronto informs users of nearby bus or streetcar arrival times. Developers tapped Toronto’s Open Data API that provides real-time transit results across the city to make this app work. Imagine being able to simply walk up to a bus stop and immediately know how long your wait time is – no texting a number, no fumbling with an app to get a schedule. If you do get to that bus stop and discover you have a lot longer to wait than you’d like (too common an occurrence in Toronto) then maybe you’ll want to hop on a Bixi bike instead. This bike-sharing service has bike stations around the downtown core that are loaded with bikes just waiting for your short-term rental. With the app, created by Kuang, you can see if a nearby station has bikes available for rent – or if you’re already biking, you can see if there’s an open station to return the bike.